Speakers that you can wear over your sneakers. What a novel concept. Heck—it even rhymes! Sneaker Speakers! 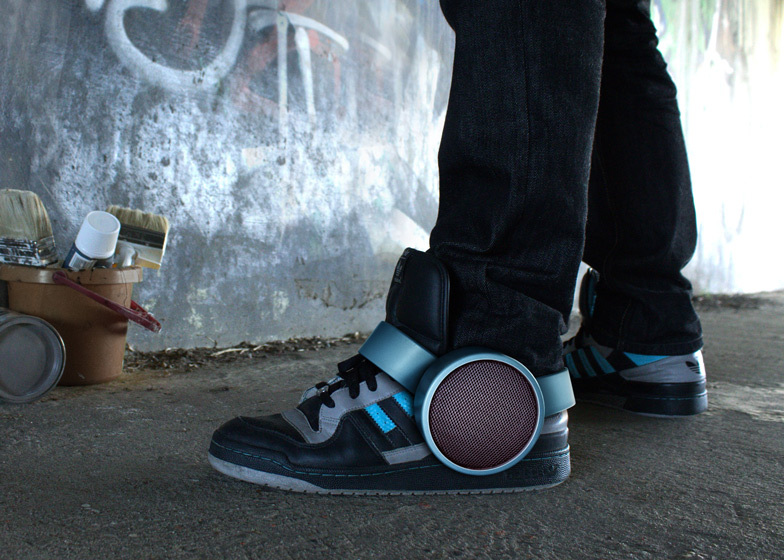 New York design studio Ray Kingston Inc. came up with the idea of wearing a wireless speaker over one’s sneakers. 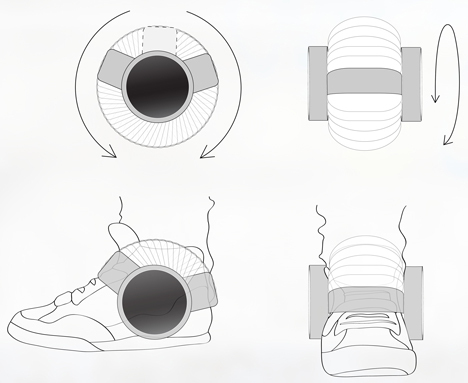 The device maintains its charge via battery power and is held in place with straps that can be moved around the wearer’s ankles to sit in different positions and conform with the shoe itself. As for playing music, the speakers get paired with electronic devices like mobile phones, iPads, and anything else capable of using Bluetooth technology. If, however, you’re still rocking the original iPod, fret not my stone-age techie: the speakers also come with an AC input so that it can connect with a stereo jack. What makes the Sneaker Speaker even more impressive is the fact that it’s the first product to come out of Kingston studio. Talk about starting off on the right foot! (I had to say it and no, I’m not sorry). We’re certainly believers — after all, wearing a portable speaker is one of the great selling points for our full family of products, so I mean, how could we not support them? Keep up the great work Kingston! This is what happens when you take someone interested in fashion and send them to tech school. Meet Tesia Kosmalski — she’s the outside-the-box thinker here who come with a concept of wearing speakers in one’s coat for what she’s calling the “Echo Coats” series. Basically, the coats are meant for a woman (or man, if he is so inclined) to playfully announce their arrival in a public space. 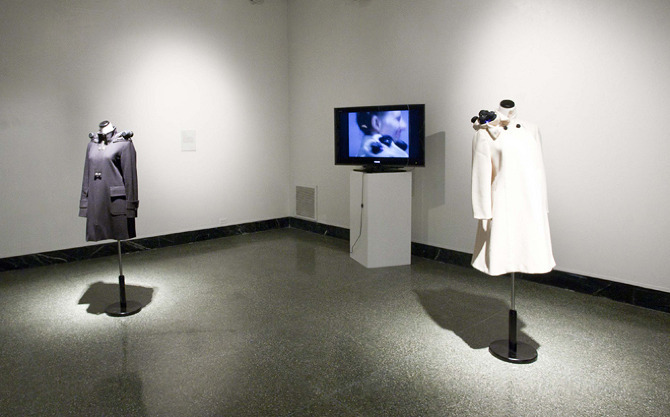 There are two variations: First is the “Adante Coat” which, as Kosmalski describes it, “teases the world around its wearer by uttering sensual cosmetic titles, originally meant to tempt her own purchasing power.” Interesting description — not sure what it means, but interesting nonetheless. 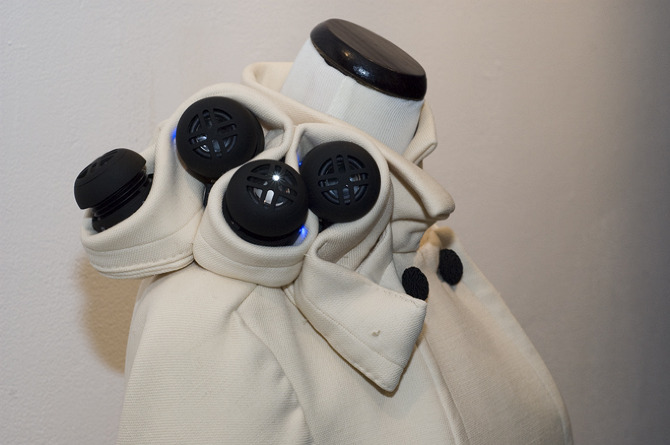 The second variation is called the “Staccato coat” and it releases machine sounds from the shoulders to urge people near the walking speaker / woman to get out of her way. Now, while the concept is certainly out there, its execution is actually pretty impressive. 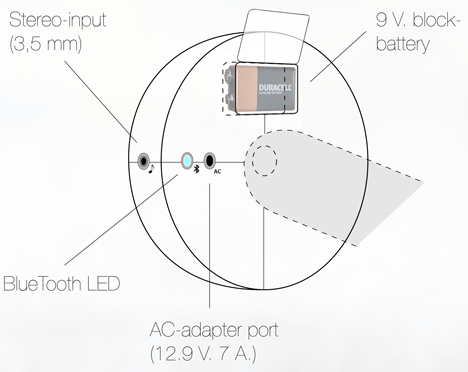 Technology involved includes mini-speakers — sadly, none of our good looking, ultra portable, super lightweight portable speakers were considered for this project — as well as headset microphones and iPods. The MP3 players run a program called RjDj, a reactive music app that combines live environmental sound through headset microphone and sound programming within the iPod itself. The coats, in turn, use these mikes as touch sensors and sound detectors to influence the audio playback. 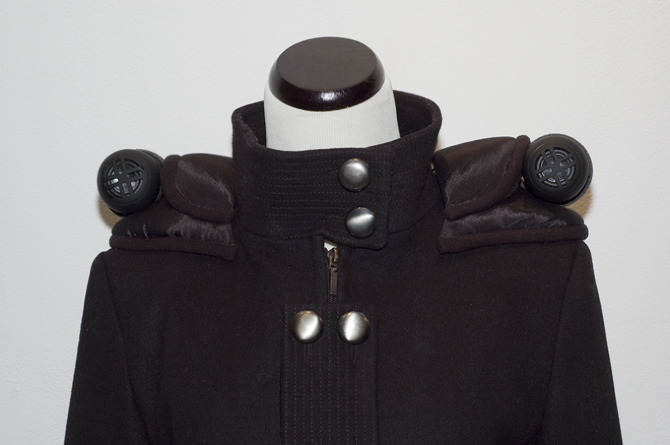 The mini-speakers, meanwhile, are hooked up to the MP3 player and embedded on the outside of the coats to turn any nicely dressed person into a walking sound circus. 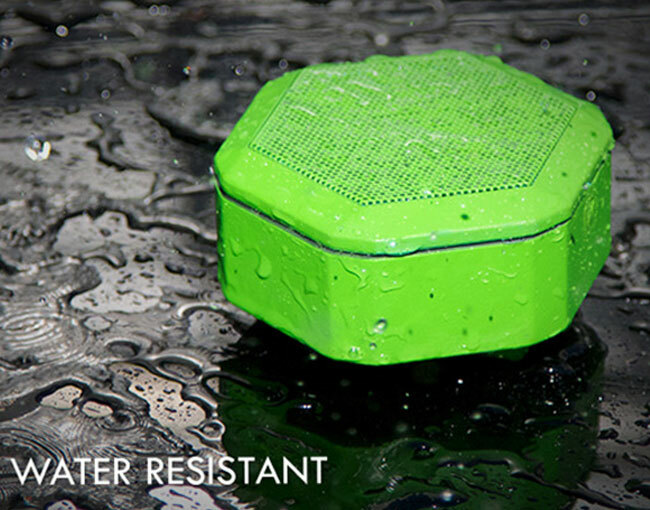 It’s no doubt a notable feat, but when you consider that there’s a full line of quality designed portable speakers that you can wear ALREADY available on the market, this all seems a bit trite, no?